Binary relationships and subtype-supertype relationships are defined between participant objects in information models. Binary relationships have two main participants and one optional associative participant. The associative participant object can't be either of the main participant objects in a binary relationship. However, the main participant objects may be the same object, i.e. when the binary relationship is a reflexive relationship (discussed in OOA96). Subtype-supertype relationships have one supertype participant and two or more subtype participants. A specific object can't participate more than once in a subtype-supertype relationship. To identify a particular participant you need the relationship and object involved. However, you also need additional information to distinguish between the main participant objects in a reflexive relationship. The verb phrases associated with the main participants can be used to distinguish between them in a asymmetric reflexive relationship. However, verb phrases can't be used to distinguish between main participants in a symmetric reflexive relationship (introduced in OOA96). Several existing action languages use verb phrases to help identify participants in relationship navigation expressions. Obviously, this is not sufficient for symmetric reflexive relationships. OOA08 formalizes the concept of participant role so that verb phrases don't need to be used to help identify participants. Participant roles include first, second, associative, supertype, and subtype. The first and second roles arbitrarily denote the main participants in a binary relationship. The associative role denotes an associative participant. The supertype and subtype roles denote a supertype and subtype participant respectively. OOA08 initially defined all of these roles as literal values. However, the first and second roles can now be changed allowing short role names to be associated with the main participants of a binary relationship. In practice, participant roles are only used with reflexive relationships. In asymmetric reflexive relationships, the roles should be self evident, e.g. 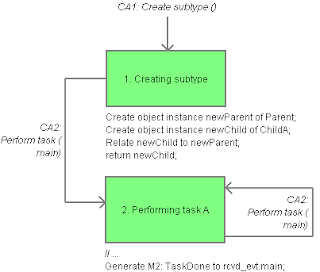 the roles client and server are used in the reflexive relationship between Domain objects formalized by the associative Bridge object (from OOA of OOA). In symmetric reflexive relationships, the default first and second roles should be used. OOA96 introduced the concept of polymorphic events into Shlaer-Mellor OOA. 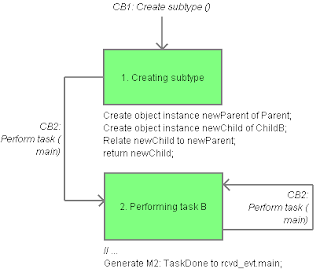 It allows a supertype object to define a polymorphic event which is mapped to events associated with subtype object lifecycle models. A polymorphic event is generated without the need to know which subtype object is associated with the polymorphic event's supertype object. A mapped event is either a lifecycle model transition event (known as a true event) or another polymorphic event where the subtype object is itself a supertype object in another subtype-supertype relationship. Obviously, mapped events can't be assigner model events or creation events since a supertype and subtype object instance must exist for a polymorphic event to be routed. Polymorphic events and their corresponding true events may or may not have the same meaning. OOA08 defines a new type of event destination called a polymorphic destination for encapsulating a set of polymorphic events associated with a specific subtype-supertype relationship. It defines the label prefix for a polymorphic destination as the subtype-supertype relationship ID followed by a -P suffix, e.g. R2-P. This eliminates the need in OOA96 to use a * suffix when referencing polymorphic events since the -P suffix performs the same function. Polymorphic destinations are the only event destinations that do not appear on communication models. However, true events do appear on communication models with a prefix indicating the polymorphic event which is routed to the true event, e.g. R2-P1 → CA2: Perform task. OOA08 uses a right arrow rather than the equals specified in OOA96 since an equals suggests a bidirectional relationship which doesn't exist. Since polymorphic events are associated with a subtype-supertype relationship rather than a supertype object in OOA08, a polymorphic event always results in one and only one true event being generated. A polymorphic event in OOA96 (and Executable UML [xtUML02]) results in one and only one true event being generated per subtype-supertype relationship that the polymorphic event's supertype object participates in. However, Kennedy Carter (for Executable UML [xUML04] and Shlaer-Mellor before this) defines significantly different semantics for polymorphic events. They allow a polymorphic event to be received by all state models in the subtype-supertype hierarchy including the initial supertype object. Furthermore, they require that any actions that are performed in a supertype object complete before the polymorphic event propagates down into subtype objects. This definition of polymorphic events is not supported in OOA96, OOA08 or OOA Tool. OOA91 requires all attributes associated with an object instance to have one and only one value (see first rule of attribution on page 19). However, OOA91 allows these values to be accumulated over time in a lifecycle model (see page 61). Thus, some attributes may not have a value at certain points in time. OOA08 formalizes this property of attributes as conditionality. An attribute must always have a value if it is not conditional, whereas, an attribute may or may not have a value if it is conditional. A (1c) suffix may be used to label attributes which are conditional. A simple attribute is conditional only if the attribute is explicitly made conditional by the analyst, i.e. by setting Manual Conditional status. Obviously, a simple attribute with an initial value that is final is never conditional. A mathematically dependent attribute is conditional if its value calculation code is not guaranteed to calculate a value or if the attribute is explicitly made conditional by the analyst. A referential attribute is conditional if its associated base attribute is conditional, or if all navigation paths from the referential attribute to the base attribute are conditional or if the attribute is explicitly made conditional by the analyst. Obviously, a referential attribute with a literal value is never conditional. A polymorphic attribute is conditional if any of its true attributes are conditional or if the attribute is explicitly made conditional by the analyst. Associating an initial value with a conditional attribute still makes sense since OOA08 allows a conditional attribute to be cleared. An attribute with no current value contains a special UNDEFINED (but typed) value. A non-conditional attribute with no associated initial value will be initialized with the default value (if there is one) of the attribute's associated data type when an object instance is created. A conditional attribute with no associated initial value will not be initialized even if there is a default value. OOA08 (and OOA Tool) requires all Action Language code to strictly obey conditionality constraints. When an object instance is created, all non-conditional attributes must be assigned a value within the enclosing action (if they don't have an initial or default value). 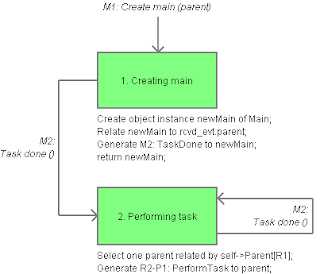 If the enclosing action is modelled using a process model then all non-conditional attributes must be assigned a value within the enclosing accessor process (an accessor can access multiple objects in OOA08). This is a much stricter requirement than OOA91 which allows conditionality constraints to be satisfied within actions triggered by events sent from the original enclosing action. The problem with OOA91 is that there is no easy way to determine when conditionality constraints are broken. OOA08 takes the view that conditionality constraints are only useful if they are enforceable.